Today, you will hear a lot about the March on Washington for Jobs and Freedom. It was the setting for the most celebrated words of the Reverend Dr. Martin Luther King, Jr., what has become know as the “I Have a Dream” speech. He was not the only speaker, nor were the speeches intended as the primary focus of the event. The attendance was the real goal; getting as many people to march as possible. Dr. King certainly made the biggest impact, and his speech that day was a turning point. It overshadowed even the people who were credited for their organizing. It dwarfed others who went uncredited. I’ve written about Dr. King several times before, but I want to talk today, on MLK Day, about a man who made that speech, that whole event, possible. He trained the marshals for the parade. It was his responsibility to organize the buses carrying people to the event. He set the schedule of speakers. This was a man whose entire arrest record was read into the congressional record by segregationist senator, Strom Thurmond. His name was rarely mentioned except to attempt to defame him or use association with him to defame others. We are only just now starting to hear the name Bayard Rustin mentioned when the March on Washington is discussed because he was intentionally denied credit for his effort at the time because he was a gay man. His impact on civil rights, and on Dr. King, cannot be over-stated. He is credited with helping teach Dr. King the principles of non-violence. He was also a socialist, and his work on employment and income equality shaped the message of Dr. King, King himself focusing more and more on economic inequality from the March onward. He helped integrate labor unions for the AFL-CIO and worked on refugee issues and gay and lesbian rights in the 70s and 80s. He was on a humanitarian mission in Haiti when he died in 1987. Finally, he is getting the recognition that he was denied in life. He has been written about. His name has been added to the history of the March. On November 20, 2013, President Barack Obama posthumously awarded Rustin the Presidential Medal of Freedom. Real Justice Cannot be Accidental or Single Issue. Mr. Rustin was a powerful leader and organizer. The fact that even in the Civil Rights Movement, his homosexuality was held against him tells us a lot about how strong identity is. The leaders of the Civil Rights Movement were not immune to prejudices and discriminations themselves. They accepted Rustin’s labor, but withheld recognition he was due. We can learn from that, in that as liberal as we try to be, we are all still members of a culture rippling with racist, sexist, ablist, and age related prejudices. Our best intentions must be carefully examined to free them of unintended consequences. 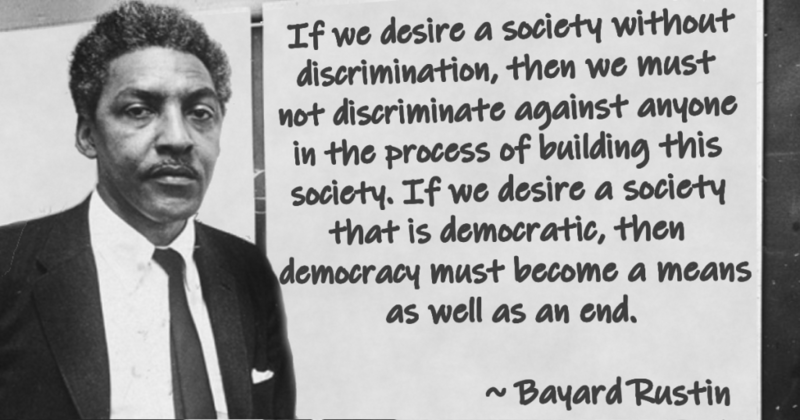 We must build a society that is free of discrimination in all forms, simultaneously.